What's more exciting than saying "I Do" 10,000 feet in the air above the Las Vegas Strip? Getting married in a Las Vegas ceremony helicopter is a once in a lifetime experience, that will guarantee an exciting and romantic memory. Your night will begin with a luxurious limousine picking you up and transporting you to the helicopter terminal. Upon your arrival you will be greeted with a 12 rose bouquet and matching boutonniere and your pilot, minister and your professional photographer. 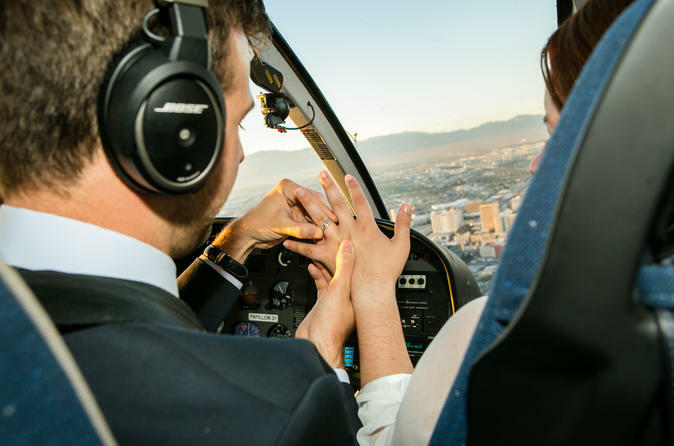 Once in the air above the Las Vegas Strip, you and your spouse will commence your commitment ceremony while enjoying views of Las Vegas' grand locations including the Fremont Street, the Stratosphere, Caesars Palace, Bellagio, Paris, New York New York and much more.